A federal judge on Thursday sentenced a 21-year-old Northern Virginia man to 25 years in prison for trying to join an al-Qaeda-linked terrorist group in Somalia and making threats to the creators of TV’s “South Park” show over their depiction of the prophet Muhammad. Zachary Adam Chesser of Oakton pleaded guilty in October to charges of providing material support to terrorists, communicating threats and soliciting crimes of violence in his case, which is being prosecuted by the U.S. Attorney’s Office for the Eastern District of Virginia. The government had asked for the maximum sentence of 30 years in prison. As part of his plea, Chesser agreed to request no less than 20 years. During an hourlong hearing, Chesser – who wore a beard and a green prison jumpsuit – told Alexandria U.S. District Judge Liam O’Grady he was remorseful. “Your honor, I accept full responsibility,” he said. The sentencing bookends the tale of a suburban Washington man friends described as “freakishly intelligent” and who became known to the FBI as a prolific Internet propagandist for al-Qaeda. He was arrested in July, days after he and his wife drove with their infant son to New York’s John F. Kennedy International Airport. He was stopped there after he tried to board a flight to Uganda before heading to Somalia, where he planned to join al-Shabaab, an Islamic terrorist group trying to oust Somalia’s government. Chesser also admitted to making threats from April to July over the Internet to “South Park” creators Trey Parker and Matt Stone, saying they would “wind up like Theo Van Gogh.” The reference was to a Dutch filmmaker gunned down in 2004 after he attacked the treatment of women in Islamic society. Chesser said his targets included a Florida man known as “JG,” a teenager in Mississippi and a young man from Texas who participated in an “Everybody Draw Muhammad Day” group on Facebook. Chesser also confessed to posting a link to 200 books on jihad and warfare, and to encouraging “fake operations” – such as placing bags that appear to be suspicious packages in public places – to desensitize federal agents to actual attacks. How Chesser changed is something he and his family still seem to be grappling with, according to court filings. His father, stepmother and Chesser wrote letters to the judge in an attempt to influence his sentencing and explain his change in behavior. As a kid, Chesser drifted from “one obsession to another,” according to court papers. At one time he was a vocal antiwar pacifist who grew his hair long and listened to heavy metal music. His interests varied, as he later studied Japanese and Buddhism. He joined a largely ethnic Korean breakdancing team. 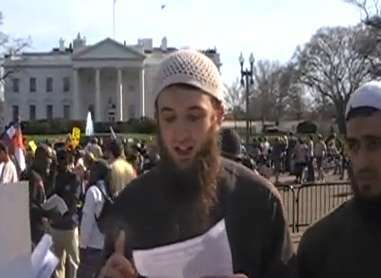 From his small apartment in Northern Virginia, Chesser – who became known online as “Abu Talhah” – spent hours on the computer, posting on radical Islamic Web sites, forums and blogs. He wrote about “Destroying the West” with a list of ideas that included filling tanker trucks with Ricin. His blog, titled “themujahidblog.com,” was “dedicated to those who give their blood for [Islam] and “primarily devoted to spreading knowledge regarding Jihad and the Mujahideen,” according to court documents. The cleric has been linked to last year’s massacre at Fort Hood and an attempt to blow up a Detroit-bound plane on Christmas Day. Chesser said in his letter to the court that the “element of radicalism” in the papers “served as a gateway for me to other more extreme beliefs.” According to the FBI, Chesser exchanged e-mails with Aulaqi. Seriously, I hope his change of heart is sincere. Only time will answer that question. Was doing some research for Internet Antropologist and found this very informative article. We (and that’s a collective “we” including many different people and many different websites) have been saying this for a LONG time. The violent postings of terrorist wannabe’s on the internet need to be taken seriously. That’s why we’re so adamant that YouTube, Facebook and other social networks abide by their posted TOS. The less outlets the terrorists have to congregate in, the more likely than can be caught. …On July 10, Chesser was barred from boarding a flight New York to Uganda. According to an affidavit filed in the case, he admitted his intention was to travel to Somalia to fight for al-Shabaab. Chesser also said he brought his infant son with him as a cover “to avoid detection of his intention to join Al-Shabaab in Somalia,” the affidavit said. It is a fallacy to believe that such people don’t constitute a security threat. “There are so many [jihadists] that have a big online footprint before they go violent,” Brachman told the IPT. For example, Faisal Shahzad, who pled guilty in the May Times Square plot, reportedly blogged on jihadist websites dating back to 2006. Hasan corresponded with Awlaki and other radicals via the Internet prior to the Fort Hood killings. Colleen LaRose, AKA “Jihad Jane,” posted frequently in favor of jihad prior to her arrest on charges of providing material support to terrorism and plotting to kill a Swedish cartoonist for depicting the prophet Muhammad. The trend of American jihadists moving from advocacy to armed violence is likely to accelerate. For years, jihadists had accepted the concept that some of them would engage in violence while others could help with online advocacy, Brachman said. But he senses that this outlook is shifting dramatically. The turning point was a December 30 suicide bombing in Khost, Afghanistan which killed seven CIA officials and a Jordanian official. The bomber was Humam al-Balawi, a double agent and a prolific jihadist blogger. Jihad using the Internet and social media is now regarded “as a staging ground and not an end in itself,” Brachman said. Go read the entire thing – it’s a who’s who of American terrorists. And how they got there.